For universities nationwide, getting students through the dining hall doors and to their daily meals is a constant struggle that requires a delicate balance of student convenience and throughput. Biometric applications have garnered demand in a number of locations across the contemporary college campus, particularly those locations where students don’t want to carry their cards. But biometrics has extended beyond rec centers, athletic facilities and team locker rooms, as more universities are deploying the technology at campus dining halls. While a vast majority of universities use the campus card to facilitate dining hall entry, some institutions have decided to leverage biometrics at the dining hall door, enabling the students to be their own meal ticket. As the technology continues to evolve, with both scanner hardware and matching algorithms becoming more robust, biometrics seems a viable alternative to the traditional campus card. According to Stallsmith, there are a few primary factors that contribute to the performance of a biometric dining system. As Smallsmith makes clear however, there will always be a place for the student ID card. “We don’t believe campuses are ready to ditch ID cards, but there are certain applications where biometrics seem to work better and faster than mag stripe or contactless cards,” Stallsmith explains. In addition to its hardware and software evolution, biometrics as a medium has grown as well. Biometric modalities now range from the standard fingerprint to advanced vascular biometrics, keystroke recognition and even gait. Modality is just one of the many factors that contribute to the success of a biometric implementation, but it’s an important consideration, nonetheless. What modality, then, is best suited to the university dining hall? ColorID offers fingerprint and palm vein sensors, as well as an iris recognition solution. Stallsmith believes it’s the latter that holds the most promise in dining applications. “The algorithms for fingerprint and palm vein aren’t fast enough to match against a larger database, and thus requires a PIN or card to match against a template,” adds Stallsmith. For dining hall applications where convenience is key, carrying an additional factor of authentication in the form of an ID card or a memorized PIN doesn’t enhance the experience. One-to-many matching means that the iris systems can yield a match much quicker, making it an ideal modality for populations of 2,000 or more. Iris authentication is achieved by taking pictures of the eye and using the iris patterns to create unique numbers, called templates. These are then matched against all the templates in a database. Stallsmith explains that a typical iris identification transaction is completed in just two seconds, from approach to approval. “Across the board, we have found that iris recognition performs better than other modalities, though iris systems tend to be slightly more expensive,” Stallsmith adds. An ever-present consideration, cost will likely be a sticking point for most institutions considering a biometric deployment at the dining hall. Stallsmith goes on to explain, however, that when used in high-throughput applications, sensor costs can be quickly distributed across the larger number of users. In practice, iris seems to be gaining momentum in the campus dining space. George Mason University has installed iris systems in all campus dining halls, and Stallsmith estimates that another six universities are in the planning and pilot phases for similar projects. At Georgia Southern University, more than 10,000 students have enrolled in an iris-based transaction system. 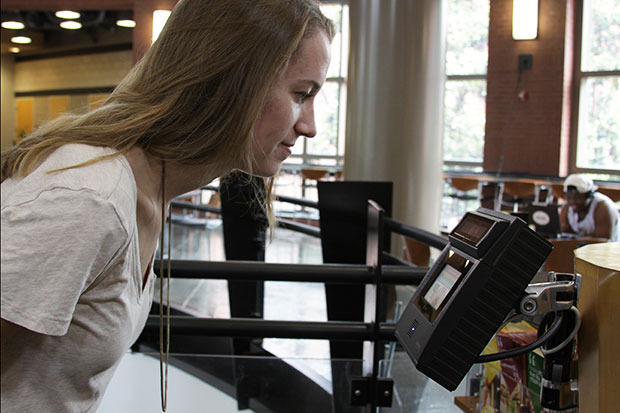 To date, the university has logged some 1.2 million iris-based transactions since the biometric dining solution’s implementation in the fall of 2013. Selecting an affordable biometric solution is still only part of the concern for university administrators, as the integration process can be complicated without the proper preparation. “Each user’s card number is entered in the biometric system during enrollment, which can normally be done while the ID card is being printed,” he adds. So long as there are hungry students on campus, there will be lines at the dining hall. Being able to get students through the door and to the dinner table as quickly and efficiently as possible, then, will be a vital concern. Meanwhile, the use of biometrics on the contemporary college campus continues to grow in both adoption and variety of use. As iris, fingerprint and other modalities continue to evolve, dining hall applications could be the latest to benefit from the technology.